By Charles Boehm – PHILADELPHIA, PA (Jan 12, 2015) US Soccer Players – The National Soccer Coaches Association of America’s annual convention is always rife with current and former members of the USMNT. Attendees at this year’s edition could rub shoulders with the likes of Landon Donovan and Eric Wynalda in both academic and casual settings. 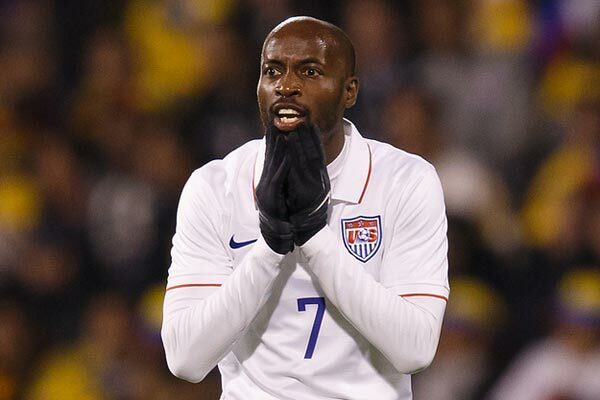 DaMarcus Beasley dropped in on the sprawling event as the newest arrival to the USMNT alumni club, having surprised many observers by suddenly, quietly calling time on his distinguished international career last month. Beasley became the only American to play in four World Cups with his contributions in Brazil last year. The seemingly ageless Houston Dynamo fullback remained in favor with coach Jurgen Klinsmann. He was widely expected to keep chugging ahead. But the 32-year-old decided that it was time to develop other aspects of his life, one of several topics he discussed with USSoccerPlayers.com after helping an old friend present a youth skills training program called ReThink Soccer to convention goers on Friday. So does your involvement with a product like this mean that you’re looking to transition into the coaching business? Not really, to be honest. I’ve thought a little bit about what I want to do when I’m done, but coaching probably wouldn’t be one of them. You don’t have to be a coach to implement this curriculum. I have camps back in Ft. Wayne [Indiana] and they’ll all learn this way of how to play football and how you want them to grow. That’s what the whole thing’s about. I saw the whole video and I really thought it was something that’s going to develop players, especially in this country, and help to get the extra leg up on the world, because it’s teaching skills at such a young age. Before, we were teaching kids how to do all these turns and moves at 14, and kids in Europe and South America and Mexico, they’ve been doing it since they were 8. So we’re already six, seven years behind, trying to play catchup. So stuff like this is definitely going to help. Just last summer Jurgen Klinsmann had expressed the possibility that you could keep playing all the way through the next World Cup in Russia in 2018. What made you decide to step aside now? I haven’t done that many interviews. I’m not a guy to be in the spotlight. That’s why I did it on Instagram … I didn’t make this big show, I just wanted to do it my way. I just thought it was time – my priorities are different now. My family is very important to me. I just had a daughter, she’s 10-and-a-half months now – we’re actually doing things to get ready for her one-year party – and that was my main focus, my main reason for doing it. When I spoke to Klinsmann, he was shocked, because it was kind of out of the blue. We had a long talk, but he understood my decision. He said he did the same thing when he decided to retire, because he had just had his kids at that time when he was getting older, so he felt it was time to concentrate more on his family than the German national team. So he understood where I was coming from. He told me I was in his plans for 2015. You’ve always been open and forthright with the press over the years, but last summer you declined to speak with journalists at the World Cup. Why? I felt that, if this was going to be my last World Cup, I wanted to make it special. I didn’t want any distractions. I didn’t want to get questions about … I mean, I have a lot of doubters. I know that. I can read. I didn’t want any distractions like the media saying this or anybody saying this – I just wanted to concentrate on football, do what I had to do. I wanted it to be my best World Cup, give everything I could for the team and try to win it. That was our goal. Obviously we came up short, but that’s why I decided not to do any press at the time. Have you seen the US soccer media change over the course of your career? Oh yeah, 100 percent. You look at when I first started in Chicago – but on a bigger scale, with the national team in ’02. The media coverage is unbelievable. It’s like night and day, to be honest. People are more interested in knowing what’s going on. You got our players now on TMZ! But that all is good publicity. You can say what you want about those things, but if soccer wasn’t getting bigger in this country, that would never happen. No one would ever care about the Landon Donovans or Tim Howards. The way our sport is growing, it’s pretty amazing to see. Our stars are big-time, they deserve everything they’ve gotten. But the media and the coverage and the support, the following of soccer, is growing every year. Many players will insist that they don’t read or watch the media reports about them. Is it really a burden or distraction to be written about? DMB: Everybody reads! I mean, obviously that’s a personal question. For me, it doesn’t really get to me. I mean, it did in the past, but I kind of learned to let my football do the talking. And that’s why I stopped media for a lot of reasons, one of them being that you read and it gets to you a little bit that you have so many doubters, haters that you never thought you had … But nowadays the media can say what they want, I don’t care. Some players tell me they remember the negative stuff that the media, coaches, fans say, a lot more so than the positive. Yeah, that’s the thing. Criticism is there, and it’s good to have criticism, because it keeps you level, keeps you motivated. You can’t have everybody saying you’re great, you’re great, when you’re not. So I think it’s a good balance – but criticize players in the right way. We’ve got people out there bashing players, and they’re old players themselves. I don’t understand that. But it is what it is and they can say what they want. You note that the soccer media has gotten bigger over the course of your career. Has it gotten better? The people that are speaking about football know about soccer – not like before … I think it’s getting bigger and it’s getting better. While you quietly announced your retirement on Instagram, your old teammate Landon Donovan wound up at the center of a much more glitzy goodbye tour of sorts as he retired. Yeah, of course, that’s a very good friend of mine. But Landon’s Landon. He deserves everything he’d gotten. The thing that I admire most is, he did it his own way, and that’s Landon. When he retired, he retired. It wasn’t about people telling him what to do, him needing to go to Europe, blah blah blah. He stayed at a level – playing in MLS – and still was our best player. So it wasn’t just about him going to Europe and trying to impress other people. He did what was better for him and was going to get the best out of his career, what’s going to make him happy. Any player will tell you: If you’re happy off the field, the on-the-field stuff takes care of itself. You can play with freedom, with passion, all that stuff. If you don’t, if you’re miserable like he was in Germany, you’re not going to do well. But when he comes back here and still plays at a high level with the national team, what can you say? So I admire that, the way he did his song and dance was great. I watched the game, I even watched the [MLS Cup] final. What do you think of Jozy Altidore’s impending return to MLS? I’m excited for him. He’s had a rough time at Sunderland. Knowing Jozy as a friend, he’s happy. He’s happy to be back – it’s not about proving to people who say he can’t score any more, because he can. He’s one of my favorite players. I think he’s a great forward; he’s very skilful. Im excited to battle him, and to compete against one of the best, because he’s our leading forward with the national team, and he’ll be that for a very long time. He’s now one of the captains. So I’m looking for big things, but I’m proud of him, I’m excited. Jozy seems to inspire totally different opinions among fans than he does from his teammates. Completely different. He’s one of the most skillful forwards that I’ve played with on the national team, by far. He played in Spain, so he’s got that little extra finesse when he plays. He just needs to be happy. For a player to be at his best, he needs to be comfortable. Obviously in England he wasn’t too comfortable – whatever happened, that’s his business, but he needs to be comfortable off the field to be comfortable on it. And I think with him and Bradley, they’re going to make a pretty team. I’m sure they’re opening doors for him so he can score some goals.